Welcome to the Hampton Inn Georgetown-Marina. Travel back to colonial times, when ships packed with European goods docked in the bustling seaport of Georgetown and sailed off with rice, lumber, and other products of the lowcountry. 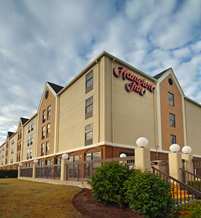 The Hampton Inn® hotel in Georgetown-Marina is located off US 17 at the Intercoastal Waterway Bridge, adjacent to the Georgetown Landing Marina. We are conveniently situated about a half-hour from Myrtle Beach and one hour from Charleston. Rediscover the past in the Georgetown Historic District, where you can browse unique specialty shops, preserved homes, historic theaters and more, within walking distance from our Georgetown hotel. Explore the Charles Fyffe House from 1765, or take a tour of the Rice Museum. Our Georgetown hotel also gives you easy access to the coast, with beaches only about ten minutes away; as well as numerous local golf courses. Don't miss annual events like the Festival of Wines and the Harborwalk Festival. You can also take a short drive to the world-class entertainment of Myrtle Beach, or the big-city thrills of nearby Charleston. Ask the team at our Georgetown hotel for more tips on all the local attractions. Even if you're in Georgetown to enjoy the great outdoors, we want you to enjoy our great indoors as well. That's why we offer a full range of services and amenities at our hotel to make your stay with us exceptional.